Me thanking Doug for bringing me to the convention. We reached our destination early Thursday afternoon–a Marriott hotel near the Dallas-Fort Worth airport. The facilities were great. There was a large open meeting with dealers around the edges and organized gaming in the center along with several smaller conference rooms. The very comfortable hotel lobby had a dozen medium to large round tables with chairs available for open gaming. The hotel bar and restaurant was right off to the side. Rick and I had room 715 on the Concierge floor at the top of the hotel–a long walk down to the gamng area, but very pleasant. The room was very clean and comfortable. 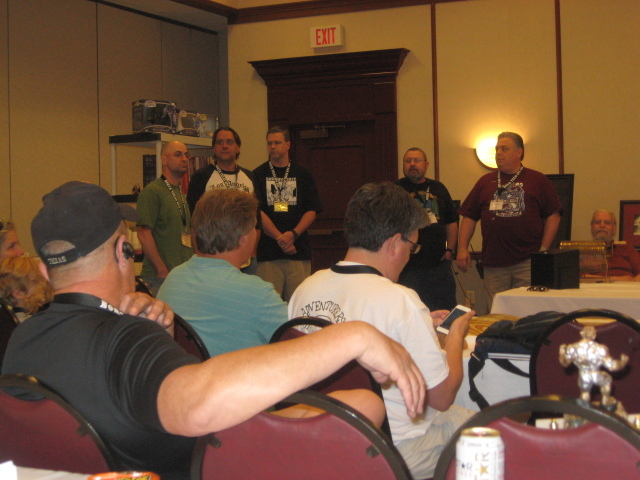 I spent Thursday afternoon meeting some of the other notables who were at the Con. 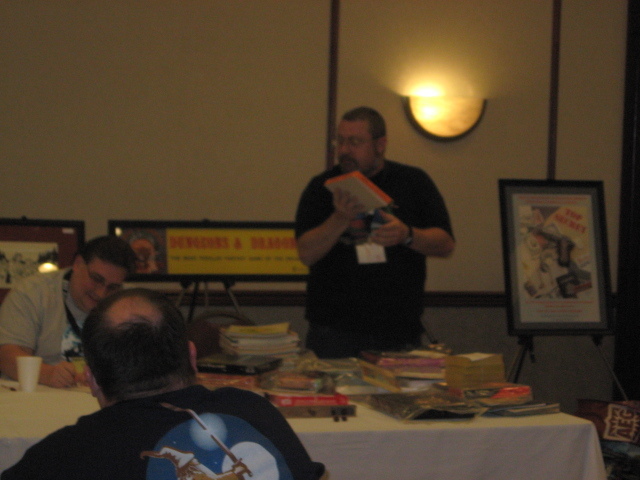 There were a lot of the real Old Guard from TSR present including Frank Mentzer, Tim Kask, David “Zeb” Cook, Steve Winter, and Jim Ward. Also present was Jeff Dee, Steve Marsh, Dennis Sustare, Erol Otus, and Sandy Peterson. Other notable guests included Peter Kerestan, Doug Kovacs, Robert Kuntz, David “Diesel” LaForce, and Jeff Easley. And many others. Obviously, I brought my camera, but I didn’t really do a very good job of taking pix at the Con. I missed a ton of the most important stuff that happened, and didn’t even really get many shots of things that I was involved in. 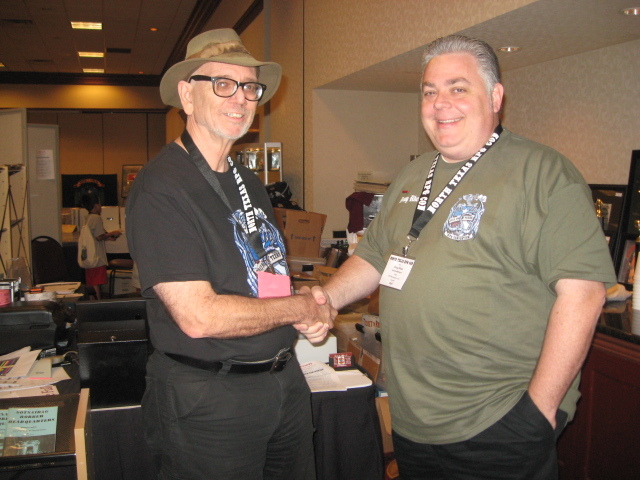 For example, I met William Meinhardt, the Deluxe T & T Kickstarter backer who paid $1000 to get my personal copy of the Tunnels & Trolls 1st edition. Bill was very laid back and amiable. He didn’t actually get his prize until Saturday morning, and then he just tucked it away, said he was glad to have it, and went about his own gaming agenda. Rebecca Heinemann and Jennel Jaquays. 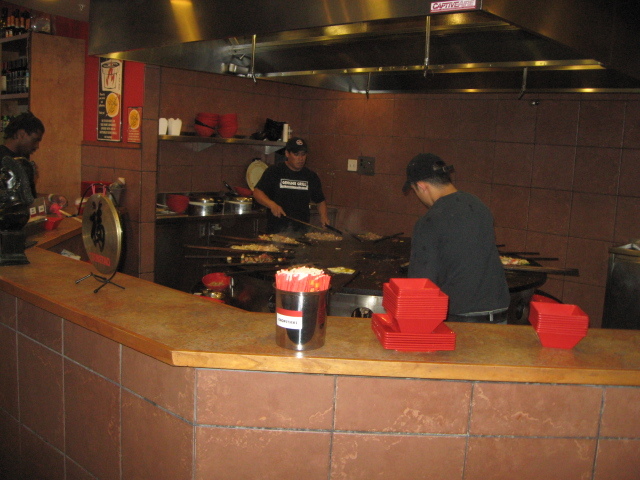 Mongolians hard at work making my supper. 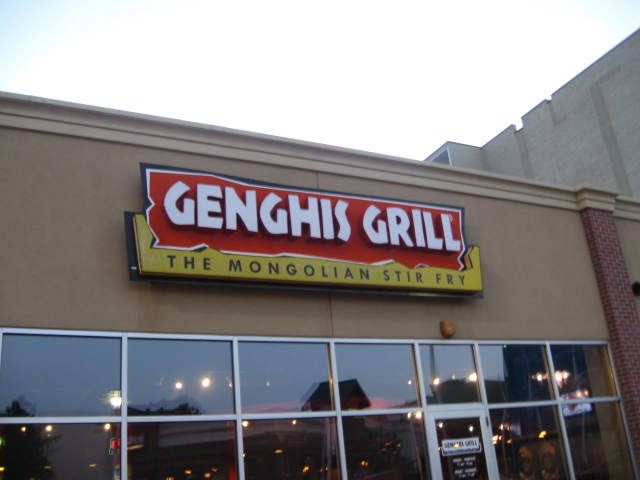 Dinner–Mongolian stir fry–on Thursday night. 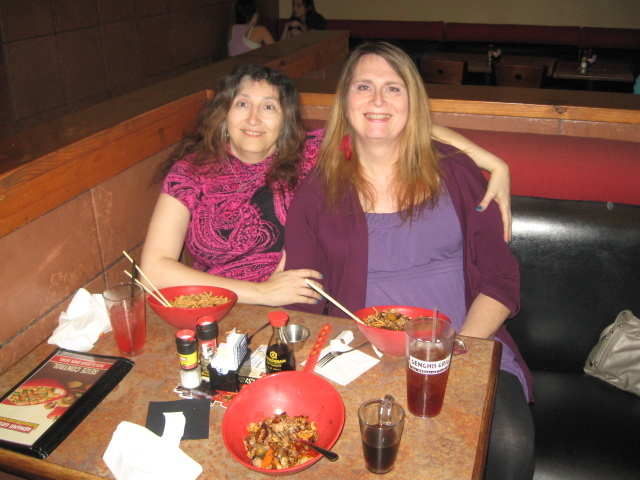 The highlight of Thursday was going to supper with Rebecca Heinemann and Jennel Jaquays. When I knew these ladies in a former life back in the late 80s they were men. The food was delicious, and the conversation sparkled. We caught up with 20 years of missed history. I learned a lot. Rebecca and I had worked together (sort of) back when she worked for Brian Fargo of Interplay in 1987 and 1988 when we did the Wasteland computer game for Electronic Arts. Back in those days I wrote story and game constraints. S(he) wrote the code that made it all work. Jennel was actually at the Con to run Tunnels and Trolls sessions. She ran two sessions of 5.5 while I was running sessions of Deluxe. Her players seemed to have a very good time. Frank Mentzer talking about That Other Game. Although there were a number of High Notables from the old TSR present, I didn’t actually spend much time socializing with them. I sat in and listened to Frank expound upon the importance of story. He introduced himself and we did talk for a few minutes on Friday morning. I also listened to words of wisdom from Tim Kask and Jim Ward. 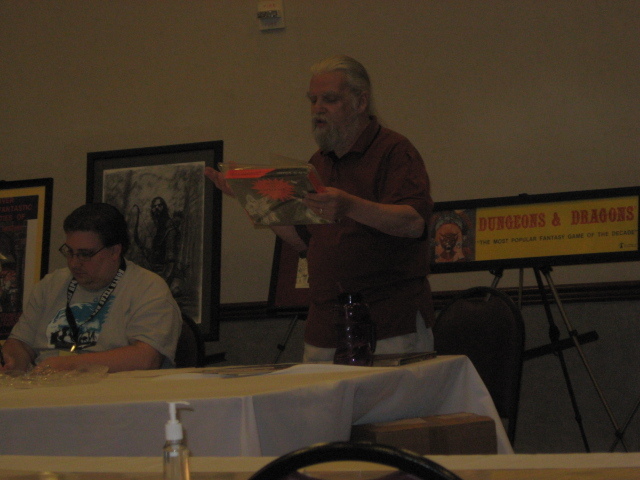 I autographed a 5th edition copy of T & T for Steve Winter on Saturday morning. Most of the role-playing going on was actually That Other Game and I even participated in a session on Saturday morning (see below). I don’t believe any of them took part in a T & T game, however, though I invited Time Kask to join my game on Saturday night (which he rather disdainfully declined) (bwa ha ha ha ha!). Jeff Dee showing two of his newest games. Of all the game designers I met at the con, the one I got along with best was Jeff Dee. Jeff is both artist and game designer. He is also a funny and amiable guy who said some nice things about the influence T & T had on him when he was very young. You can see some of his game credits spread on the table in front of him. I spent more time with him than with any other game designer, talking to him on Thursday afternoon, and playing in his Cavemaster demo on Friday morning. He’s a great G.M. He makes being a caveman fun. (I wanted a copy of that game and thought to buy one right at the end of the con before I left, but by then he had already sold out of all the stock he brought with him.) He and his talented wife Amanda promised to send me a copy when they got home from the Con. We will see if that actually happens. 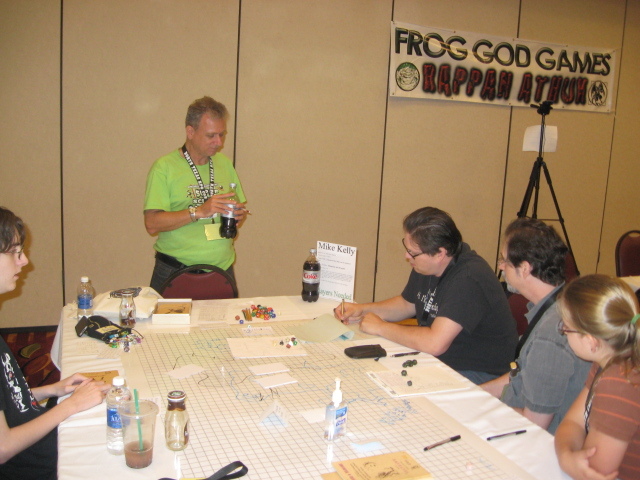 Sandy Peterson (in the blue shirt and suspenders) running his prototype Cthulhu board game. I haven’t seen Sandy in 20 years. But we were still on easy, friendly terms with each other. His Cthulhu board game looked like enormous fun, and he was running it for people non-stop every time I saw him. Alas, I did not get a chance to play it, but I want one. Serving wenches, Olivia and Jessica. NTRPG con had the most wonderful innovation I’ve ever seen at a Con. I think all small gaming cons should do it. Serving wenches!!! I was very pleasantly surprised on Thursday afternoon when Olivia (the dark-haired beauty) sought me out and told me that she was going to take care of me–if I wanted anything (within reason, i.e. food, drink, paper, messages run) that she would get it for me. I wasn’t the only one she provided with this service–Doug Rhea and Michael Badolato treated their Guests like gods. They not only paid our transportation and hotel bills, but provided food and drink at the hotel, and these ladies brought it to us. Sometimes I worked with Jessica, who was also super sweet and nice–the con days were long, and they weren’t both on all the time. They also provided this kind of mobile support for every guest of the convention, although the regular attendees had to actually pay for their food and drink. Olivia was super kind and sweet to me, and I fell in love with her very quickly. I admit I flirted outrageously with her during the entire convention. I made her laugh a lot, but I think I actually impressed her in a contest of skill and will on Saturday night (nothing unseemly happened) (In the words of the song: Wait a minute, Mister, I never even kissed her.) I felt like the Frog Prince to her Princess when she was around. If I could win her love, I would have gladly made her my queen. On the other hand, I was actually kind of the visiting dignitary, and she was part of the entertainment/service. She was a gracious hostess; I cannot praise her highly enough, and I truly hope she took my flirting in the light-hearted, friendly, and worshipful spirit that i intended it to be, and not as harassment. If she felt harassed, she was so professional and good about it that it never showed. She certainly made my convention experience memorable and pleasant, and I suspect she did the same for everyone she interacted with. Jessica was also very wonderful–I saw her in action throughout (and you will note that I took the time to learn both of their names and to spend some time just talking to them about more than my next meal or drink) and I cannot praise them both highly enough. My one stab at playing That Other Game during the Con. On Friday morning I took part in a Cavemaster demo that Jeff Dee ran. On Saturday morning I wandered into this game of O.D.&D (Odd Death and Destruction? 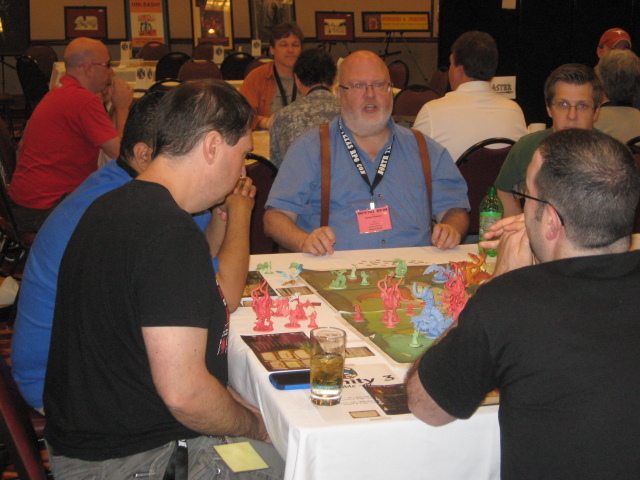 ), where the Game Master (man in green t-shirt) gave me a rather low-powered dwarven warrior to play. The game was slow, but had its moments of hilarity and fun–as any well-run rpg should have. I got bored a few times and put my player on standard orders while I wandered around or performed my religious duties with earth and water elementals, but came back for all the good fights. I called my dwarf Bertinernie. My moment of glory in the game came when I managed to make a called shot and slice off the living statue’s hand–the one holding the evil staff–during combat, and then destroy the staff itself (which seemed to be sentient) on the following combat round. Bert was the one who went back out to the flying ship and brought in a wheelbarrow to carry away all the treasure we eventually won. I was also a voice of reason who argued that having gained a ton of loot, the prudent thing to do would be to retire and spend it for a few years before going back for more. Doug Rhea presiding over auction. Late Saturday afternoon the premier event of the whole convention took place. Raffle ticket were drawn and prizes were awarded. Various people got goodies. Old rare gaming stuff brought fabulous sums of money from the mostly middle-aged crowd of gamers present who bought things in the auction. I bid a few times, but I did not manage to win anything at all. 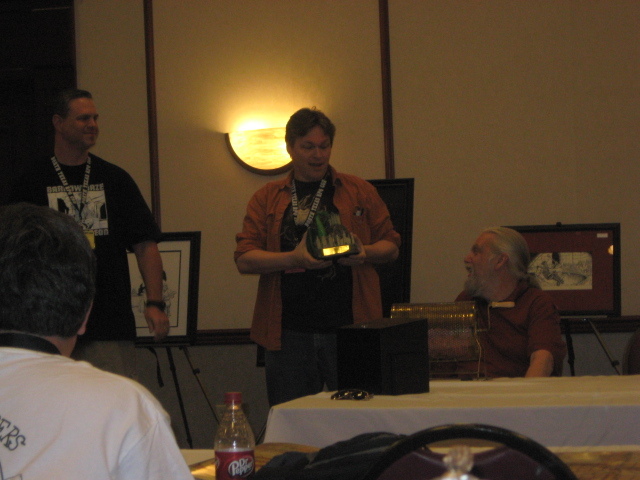 My friend Jeff Dee won the Con’s trophy/award for best new RPG of 2013 for his Cavemaster design. It’s a 5 pound green dragon paperweight that would ornament any game room or fannish home. When I later volunteered to store it for him, he told me quite firmly that he’d take care of the trophy himself. I don’t blame him at all. It was very nice. High quality! As were the other trophies awarded and and prizes associated with this con. Even though I was at a Con, I tried to eat healthy foods. 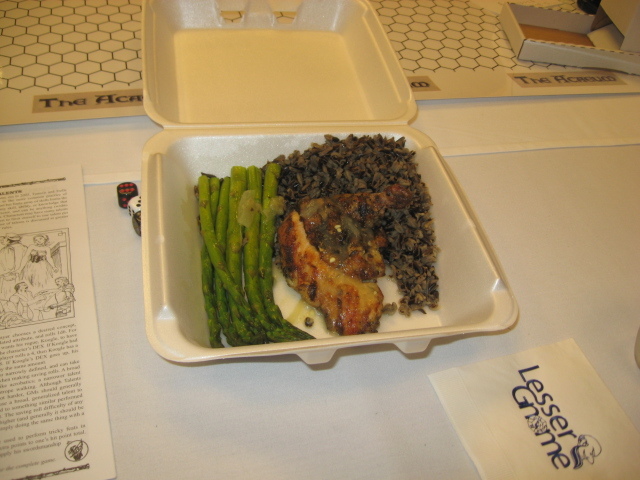 This combo of asparagus, wild rice, and chicken was my supper on the last night while running the Fire Dungeon for 6 players. I included this picture for the benefit of my trainer, Julie Marsella, so that she’ll believe me when I tell her, that even though I was living the life of a godling with (almost) my every desire being granted, I still did my best to stay in training and eat healthy. This was the last picture I managed to take. My Saturday night session of Deluxe T & T where I ran 6 brave adventurers into The Chambers of Z’Tpozz the Mad Dwarf, which is the free adventure provided in Flying Buffalo’s contribution to free RPG day on June 15, ran late, and they failed in their mission to rescue the dwarven princess of the Fire Clan, but they had a great time trying to cope with the blazing challenges of the Fire Dungeon that Bear Peters and I designed especially for the project. For a huge collection of pix from the Con, go to Facebook and look up NTRPG. I tried to make a link for you here, but it just didn’t work. You might even find a pic or two of me there. I got to bed about 1 a.m. Sunday morning, I got to sleep about 3 a.m. Sunday morning. I woke up about 5 a.m. Sunday morning, and reached the airport about 6 a.m. Our flight was delayed (again) (I’m not very impressed, American Airlines.) 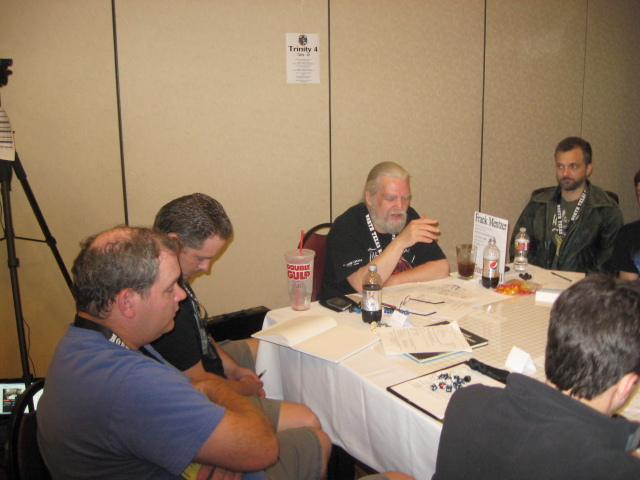 I got back to Phoenix about 10 a.m., and back to the Trollcave a little after 11 a.m., and now with the completion of this blog, the great NTRPG con adventure is over. There was an odd thing about this con. Although the show was in Texas, the home of Steve Jackson Games, there was absolutely no sign of that great gaming company at the Con. I didn’t see a single game of Munchkin played during the whole weekend. Sunday evening is in progress as I finish this. I’m off to Trollhalla.com to award the weekly bonus of TVP (Trollish Victory Points) to those who deserve them. 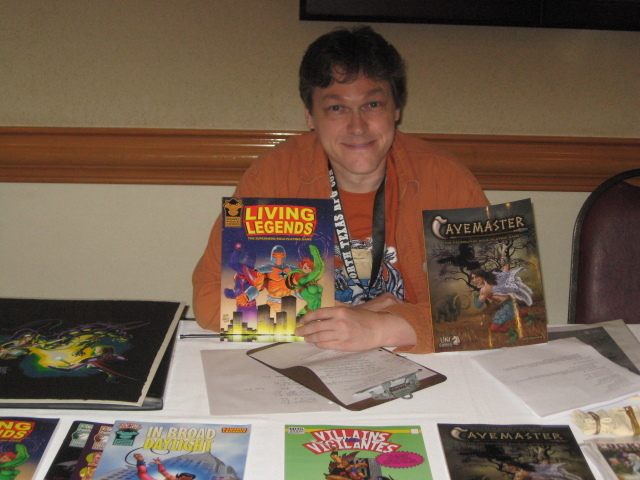 I get to rest just a bit tomorrow, and get ready for an even greater con adventure that will begin for me on Tuesday, the 11th of June, when Corencio and I will join Rick Loomis on the annual trip to G.A.M.A.’s Origins national gaming convention in Columbus, Ohio. I’ll be running some Tunnels and Trolls Deluxe while I’m there, and I’d love to see you at the show. If you’ve ever gone to NTRPG, or any gaming convention in Texas, or if you’ve ever played the trollish game with me, why not leave a comment?